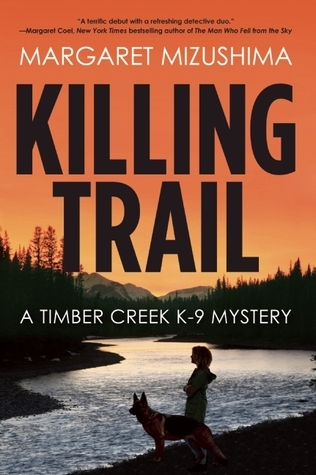 Mystery, suspense and a canine…who could ask for more? The canine in this story is Robo, Mattie Cobb’s K-9 partner who helps her solve a case in the small Colorado community that she calls home. I enjoyed the opening with its introduction to Mattie and how she came to be partnered with Robo. It’s clear that Mattie hasn’t always been the best dog handler which I felt made her more of credible character. It’s not long into the story that the duo is put to work when a young girl’s body is found. There’s also a dog who’s been shot which brings into the picture a newly single dad and veterinarian, Cole Walker. I liked Mattie’s character and her determination and vulnerability at times. I also liked Cole a lot. He too seemed full of hurt from his recent divorce and his struggle as a newly single dad. There was a hint that a relationship will develop between these two which I hope is the case. And let’s not forget the mystery. I had several suspects in mind but when the first one wound up dead, it made me read on faster to find out if my other inclination was right. This is a fast paced mystery, well layered with clues and does keep you guessing. The two things I enjoyed about it the most are the setting and the cast of characters who came across as real people. The author obviously did lots of research on K-9 training and how police officers work with their canine partners which added to the authenticity of the story. This is a series I’ll definitely be following, and if you’re looking for a new police procedural story, this is one I’d recommend you check out.